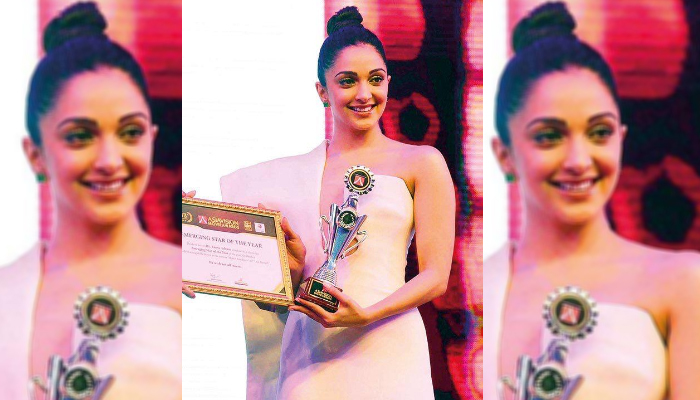 Asiavision Awards 2018- Actress Kiara Advani receives the Emerging Star Of The Year Award! With her amazing acting talent, her charm on and off screen and the huge fan following, Kiara Advani has indeed become the new favourite in the B- town. Acknowledging her achievements of the past year, the star diva was presented ‘The Emerging Star Of The Year Award’ at the Asiavision Awards 2018 as a token of love and appreciation. Kiara Advani have a massive 2018 with the many hits in her kitty. Right from short film in the digital space to two blockbusters down south, Kiara is the new favourite amongst the youth. The gala night saw A list celebrities from South Cinema and Bollywood industry under one roof. Right from Ranveer Singh to Ayushmann Khurrana to other celebrities from down south, the evening was a starry affair.Kiara, who is hopping between shoots for two of her upcoming films also made it for the award. Kiara is currently shooting for Good News opposite Diljit Dosanjh with Akshay Kumar and Kareena Kapoor in the lead and for ‘Kabir Singh’ opposite Shahid Kapoor where the diva will be seen in a de-glam look.